Robert Morris at Minnesota: The Gophers made fairly quick work of Mercyhurst at the beginning of the season, but we’ll see if the Lakers’ CHA counterparts can have more success in this series. Jaycee Gebhard continues her torrid scoring pace with 32 points this season, tied for the national lead. She’s done it all for Robert Morris; she’s the team’s leader in power-play goals (5 – also tied for the national lead), shots on goal (82), and faceoff wins (282 – again the national lead). As of now, in my mind, there’s nobody ahead of her in the Patty Kazmaier race, so we’ll see how the Gophers handle her. The challenge for the Colonials as a whole this weekend will be outscoring Minnesota, who’s currently punching in 4.22 goals per game. RMU has been fairly average in that respect—their 2.50 goals per game ranks 18th in the country—but they’re doing better in terms of actually generating offense, with 33.35 shots on goal per game, which ranks 10th. Clarkson vs. St. Lawrence (home-and-home): After the chaos that was last weekend in NCAA Division I women’s hockey, the defending national champions are all of a sudden clamoring for a win. The Golden Knights lost to both Colgate and Cornell, but so did the Saints. 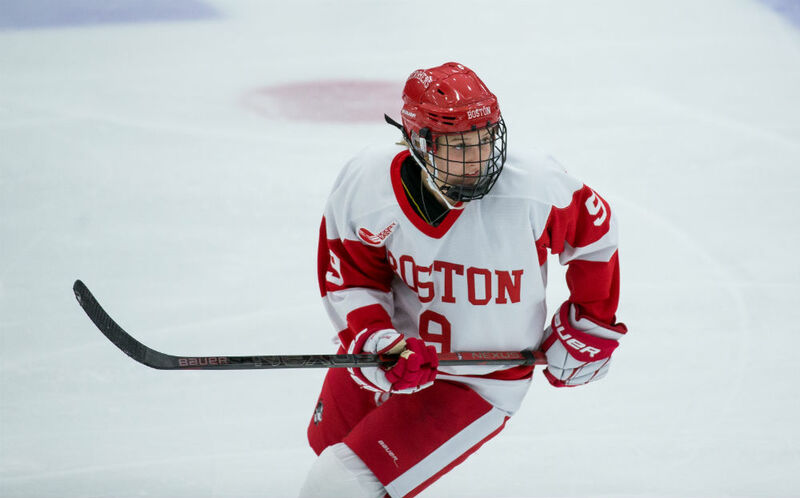 Clarkson’s top line of Loren Gabel, Elizabeth Giguère, and Michaela Pejzlová potted one goal in each of last weekend’s games, and nobody else chipped in to bolster the offense. One key this weekend for Clarkson will be getting into a better offensive rhythm, with more contributors stepping up. St. Lawrence also needs to find some more offense, after scoring just one goal in two games last weekend. The Saints already took one from the Golden Knights earlier this year in overtime, but we’ll be seeing what I’d imagine to be a very motivated Clarkson squad now. Boston College vs. Merrimack (home-and-home): The Warriors have enjoyed a good start to the 2018-19 season, but dropped two important Hockey East games to New Hampshire last weekend. They shouldn’t be taken lightly, though, and Boston College is obviously reeling a bit after last weekend’s series with BU. Merrimack is giving up the sixth-fewest goals per game in the country (1.65), and the Eagles failed to score more than twice in each game against the Terriers. What really killed Boston College against BU, though, was special teams, as noted in the above feature. The Terriers’ power play is clicking at just a 15.6% rate this season but scored five goals in two games against BC. The Eagles’ own power play was limited to one goal on 10 attempts. After falling out of the NCAA Tournament picture for the time being, they can’t afford any other slip-ups, no matter how badly they’re out-shooting teams. For a deeper dive into what’s ailing the Eagles this season, Grant Salzano of BC Interruption has a really nice write-up.